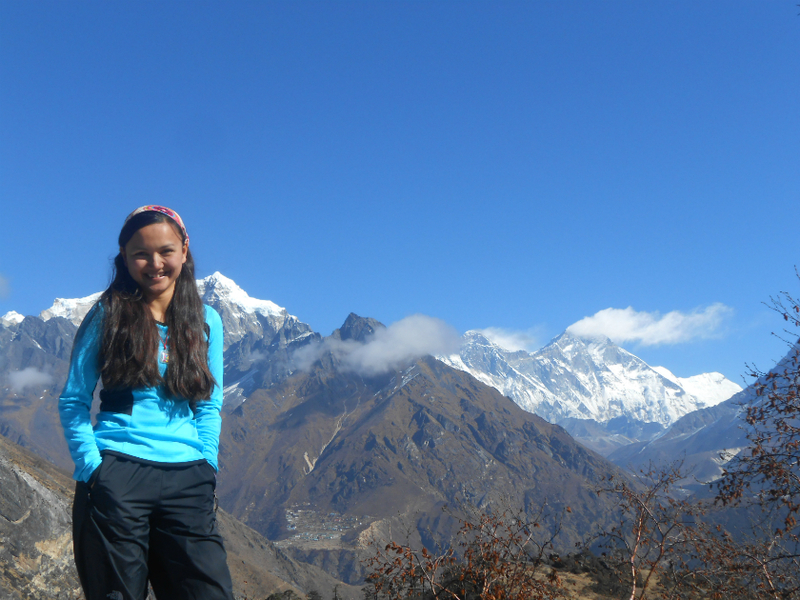 Mountaineer Shailee Basnet helping survivors of trafficking become trekking guides. Shailee Basnet was the leader of the Seven Summits Women Team that scaled Mt Everest in 2008, making them the most successful all-women expedition to Everest ever. 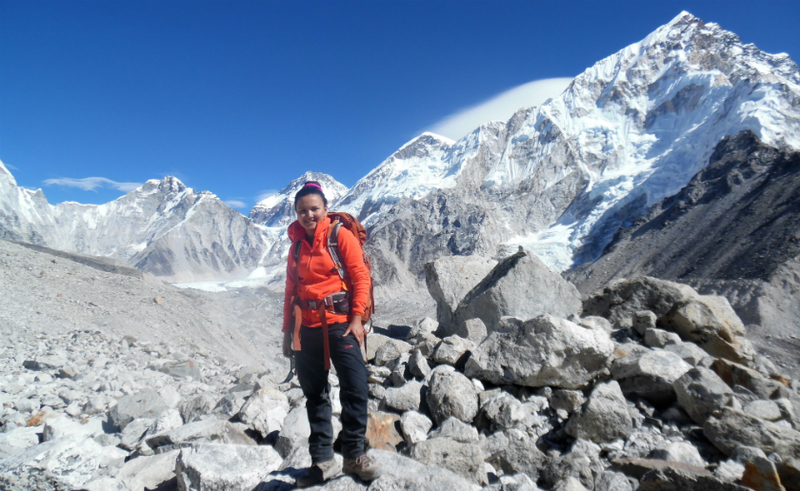 Like all the members of the team, Basnet had scaled numerous personal Everests before she arrived in Everest base camp. “Society’s apprehensions were a big hurdle in the very beginning,” she recalls. But she and her companions leapt over that hurdle, and then some. The Seven Summits Women Team went on to climb the highest mountain in each continent, becoming the first women’s team ever to attain that feat. Basnet has always been a sort of iconoclast, shattering stereotypes and going down paths that were considered for men only. She has been a journalist. She now runs a programme to help young female survivors of trafficking become trekking guides. In the aftermath of the 2015 earthquake, she and her companions led recovery work of schools in one of worst hit areas. Basnet is also a professional stand-up comic. She has performed in Nepal and the US. She told Kapil Bisht about her experiences of climbing, helping other women and trying to make Americans laugh. Tell us about how you got into mountaineering. In 2007, I learnt that the ‘First Inclusive Women Sagarmatha Expedition’ was being organised. There was an open call for interested Nepali women. I decided to join. After your team’s unprecedented success on Everest, your team had problems raising funds when you decided to climb the highest mountains on each continent. What did that hardship teach you? Before scaling Everest, people judged our size, experience, age and gender and declared our mission was going to fail. Once we scaled Mt Everest, we were applauded by all sections of society. So we thought things had changed and now everyone would believe in our abilities. But it turned out differently. When we approached people to help us fund the Seven Summits mission, they would say, “You ladies can achieve anything. You’ve proved that. But we cannot support you at the moment.” So the language changed; the outcome didn’t. We thought our struggle would end after proving ourselves. But our real struggle started after Everest. That’s life. That’s what I learned. All you can do is keep going. The most valuable lesson that climbing Everest taught you? There are too many. I could narrate one for each step. One of the biggest lessons is that outdoor is the best platform to empower. When my body was trained to do physical stuff that I had never even tried before, something changed inside me, irreversibly. I became more confident, assertive and ambitious. Besides, Everest started as a personal challenge and has now become a platform for empowering women. You learn that the journey is not just about yourself. Life has a bigger arc. One thing no amount of training can prepare you for on a mountain is death. You saw a man die on Everest. How did that tragedy affect you and your outlook on climbing, life? That night when I was on the high slopes of Everest, staring into the enormity of Lhotse with a dead body behind me, I really struggled for the few initial minutes. Why did the mountain have to kill somebody? After some minutes, I felt like it was not my place to question Nature. I just sat in prayer. Yes, it could have been me. One day it will. Until then I must keep moving while making prayers for the ones who depart. You and your teammates’mountaineering exploits are well known now, but what have you been doing after scaling the highest mountains on each of the seven continents? We came back home to a big earthquake in 2015. One of our team members, Maya Gurung is from Sindhupalchok district, which was severely affected. We’ve been supporting the recovery of four schools in her village. We’ve been building a permanent school, hiring teachers, supporting education. The goal is to provide quality education so that the villages not only recover what they lost in the earthquake but the children find a bright future for themselves. Besides, since late 2014, we’ve been training a group of young female survivors of trafficking. We support their education, provide them language, leadership and outdoors training. Two of them are now certified guides guiding people in the Himalayas. From the stigma of being a trafficking survivor with low-paying jobs, they have now become role models in their villages, making a decent income and living dignified lives. We are looking at scaling the program to train more women right now. Also, I hike, trek and if things go well, might be climbing sometime soon. Did the commercial side of mountaineering ever appeal to you as a career path or, simply, as a way of earning a living in between pursuing other interests? What truly interests me is connecting the Himalayas and youth of the country, especially women, in a way that empowers individually and economically. With my experience and skillset, I am more useful helping women, like our survivor sisters, find transformation through the outdoors. That has always appealed to me a lot more. And I’m grateful I get to do that. One of your aims was to introduce outdoor curriculum in Nepali schools. Has that happened? With the support of the United Nations World Food Programme, we reached around 150 schools across the country. We also took school kids on hikes around the Kathmandu Valley. Back in 2008, it was rare to find school kids in the outdoors. That has completely changed now. Schools are taking students for treks and hikes. And thanks to the Nepal Mountaineering Academy, our nation is offering an undergraduate course in mountaineering. We did not lead a campaign to introduce outdoor curriculum in Nepal ourselves. But there has been a sea change already which we are happy with. We are focusing our efforts on developing curriculum/program for the benefit of young female trafficking survivors at the moment. You and your teammates from the Seven Summits expedition did a lot of relief and recovery work after the 2015 earthquake. What was working in the midst of suffering and loss like? Oh, it’s climbing another mountain with many ups and downs. Lots of raw exposure to suffering, loss, grief. Yet, an amazing galvanizing spirit of getting back up. Most importantly, it opened the world to the beauty and tragedy of the mid-hills of Nepal that was there before the earthquake. For instance, lack of quality education was always a problem in the area, but the earthquake shone a light on it. Now there are thousands of people like us still supporting these schools so that they can become quality education centers. So that’s been the silver lining. And that teaches you to focus on the positive and work to make things better. People know you as a mountaineer, a motivational speaker and a journalist. Very few know that you did stand-up comedy before you climbed mountains. Tell us how got into stand-up comedy. Ha..ha. Well, not before really. I did my first show in September 2011. It was the year I hit rock-bottom. We were stuck in the mission due to financial and commitment issues. So it was a really tough time. As I was trying to navigate that, I became more and more aware of this other voice in my head. There is always an observer in my being. That voice needed a channel and that’s why I did my first show. It went really well and there’s been no looking back. 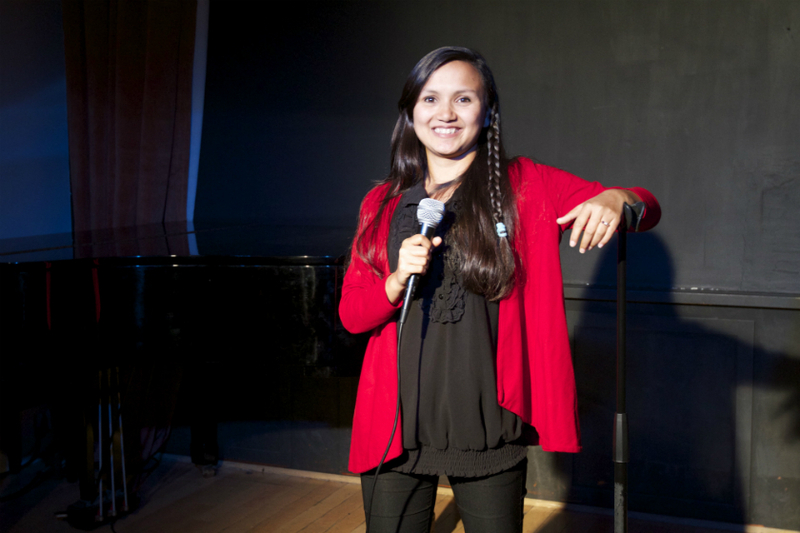 You have now done stand-up comedy twice at New York’s Gotham Comedy Club. How did that happen? Gotham Comedy Club is one of the top-ten comedy clubs in the US. Major stars perform on that stage. I was in awe just to be there. I had joined a comedy course at Manhattan Comedy School. Turns out, the owner Andy Engel is one of the producers of that the club. After seeing my graduation performance he offered me a show. It went really well. So he offered me another one. He says he is confident in my performance and is willing to work with me more. At first, you worried whether your jokes would be understood in the U.S. But then you realized that “beneath the surface, we are all the same. Human emotions, issues, even politics, it all becomes very translatable if you go deeper.”What similarities have found between Nepal and the U.S. through your efforts to plumbing to depths where it’s translatable? Well, that question has the answer. When you talk about love, politics, toilet issues, society, relationship, finances, career, health, hypocrisy, emotions we are all the same. People will not understand cultural references new to them. But comedy is about touching the human sub-conscious. That works everywhere. But you have to be a genius to do that. I’m learning. Anything in common between mountaineering and stand-up? Both are crazy. You need a degree of self-confidence to do it. Yet, realize that it is not in your hands. Both are extreme experiences, either it’s amazingly great or can become very scary. Lessons learned from doing stand-up? When I stared in 2011, there was no stand-up culture in Nepal. No open mikes, no stand-up shows, no nothing. So I had to produce shows if I wanted to be on stage. That meant taking care of everything from seating arrangement, coordinating with power-cut schedule, getting other artists and what not. So I always complained how stand-up in Nepal was difficult. From a non-existent market, I went to a saturated market in the United States in 2017. The first question my producer asked me was that he had two thousand people asking him for an opportunity: Why should he consider me? Turned out my experiences as a comic and producer in a country called Nepal set me apart from the crowd and I got a show with my name in the title at one of the biggest American clubs. So now I’m thankful for the journey. It has taught me never to complain on what does not exist. If something is not here, that means it’s your opportunity to become a leader or even a pioneer. And what you complain about might just be your biggest blessing. So shut up and just work! You have said before that humour is helpful in mountaineering. How? Everyone on my team is funny. Without laughter, it can be so damn stressful. Laughter has helped us through thick and thin. Not only mountaineering, laughter truly is the medicine for life. Your favorite stand-up comedian? Why? Ellen Degeneres. I watched her special and cried. I was truly inspired. She instilled a deep spiritual lesson through an hour of bone-tickling humour. It changed my life. That is the power of stand-up comedy. I certainly can’t choose just one. I’m especially in deep gratitude of the pioneers Tenzing Norgay, Edmund Hillary, Junko Tabei and Pasang Lhamu Sherpa. They not only paved the way for mountaineering but have shown us the power in giving back. That has helped me find meaning in the tiny steps we take on big mountains. A joke of yours that you particularly like. You have a knack for venturing into things you have never had any training or experience in. When you decided to apply for the Nepali women’s expedition to Everest you had no background in climbing, not even in sports. Now you are doing stand-up. What is it that drives you toward the unfamiliar? When I was a child I never imagined a profession for me. I knew I wanted to travel the world, have fun, and make money doing that. I come from a very security-obsessed middle-class Nepali family. Back then, I didn’t know outdoors, speaking or comedy could become a career. As I grew older, I saw that my childhood vision of life is more fun than the societal definition of conventional success. So I’m just enjoying that. That’s all. The mountaineering world is notorious for its big egos. Was that a problem in your team as well? How did the team cope with that? Thankfully, during all our missions, we had bigger problems than having to pamper egos. Haha. So that worked. Seriously speaking, our goal was always more important to us than personal egos. So ego-management was never our major struggle during the mission. You have said that “the journey outside doesn’t mean anything if the journey inside doesn’t progress.” Please tell us about the progress in your internal journey. On that, I need to write a book. In a nutshell, life is a journey. We are all here to reach our own milestones. If we miss, life will find a hundred ways to bring us right where we need to be. Sometimes I’ve found myself become too comfortable, miserable or arrogant on the outside journey that I miss the foundation of my internal being. That’s why my experience tells me the outer journey is only a compass to guide us in our internal journey. What would you say to people who wish to do something but are holding back because of doubts they or others have about their ability to do it?